Ha was wondering if you were going to do this this year or not. I’m going to be running the 5k because it’s one of the challenges I’ve set for myself this year. I’m thinking 10k next year. Maybe do 5k and try and beat the time you did it in last time? Didn’t you have to walk last year because you’d hurt yourself? So you’ve had a wee bit of time off from running it and might need to re-train. I’d be dubious about signing up for the 10k if you don’t have decent trainers to train in. Mine are in desperate shape and I’ve noticed they’re not doing me any favours now that I’m running outside and not on a treadmill, I wouldn’t want to run a much further distance. Wow this comment is ridiculously long. Sorry. Well lady, you know what I’m gonna say, 10k all the way! The challenge of doing a longer distance is going to motivate your training whereas you may get complacent with 5 as you’ve done it before. 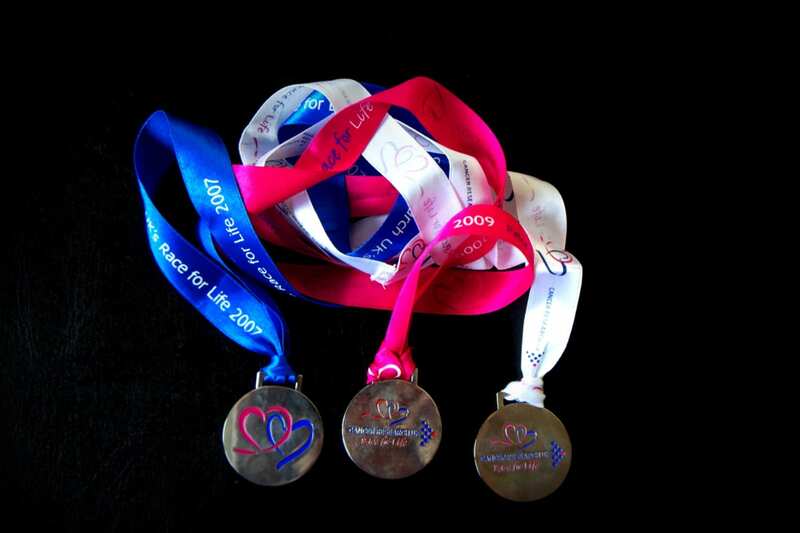 I do the race for life with my mum and sister, but only the 5k, maybe I’ll work up to the 10 one day, good luck! Wow, what a brilliant thing to do each year :) My friend does something similar and is doing a half marathon this year- I could never do anything like this so I have huge admiration for both of you! As far as 5k or 10k, maybe do what ‘the girl’ said and try to beat your 5k time? Running is absolutely not my thing at all, so wow for thinking about doing a 10k race! I’m afraid that I have no tips on running either but please let me know when and where I can add in some money (I hope this works for non-UK people?) – my mother was diagnosed with breast cancer just a little over two years ago. She’s been cured and I know she’s been incredibly lucky, so that’s a matter close to my heart! I did the 5k in 2009 but ended up only jogging for the first km and walking the rest because it was 28 degrees and there was no shade, heh. I’m not sure I could have jogged much further to be honest, I was pretty out of shape then! My fella and I are training now to do a 5km together at some point – I agree with The Girl about trying to beat your time on your previous 5km :) 10km is A LOT! & there will always be a race next year if you want to do it, or you could do a 10km later this year if you really feel like pushing yourself. Whatever you decide to do, good luck with it :) I think it’ll be a while before I’m up to 10km standard! S.
I did the 5K last year and absolutely loved it. It was a challenge training but it paid off and i manage to jog (admittedly slowly!) all the way. I want to do the 10k this year but I think I’ll be alternating jogging and walking as there is no way I could run it all. Whatever you decide, good luck! !